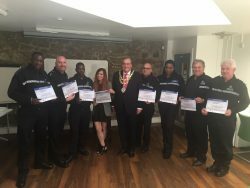 Wandsworth Parks and Events Police are the first in the UK to attain a Level 5 NVQ Event Safety/Policing. They join event managers from venues and events across the world in the receiving this significant qualification. An official certificate presentation took place on Wednesday 15 June to mark the special occasion. The qualification covers a mixture of experiential learning activities, theory and practice related to real time scenarios. This is one of the only programmes in the UK that uses scenario based learning to ensure that everyone taking part not only learns the theory but actually applies this in practice. 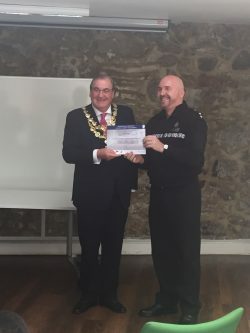 Professor Chris Kemp who teaches the course also trains the Scottish Police Force in crowded space issues and prepared them for their work at the Commonwealth Games. The programme supports all learning styles and specifically focuses on practical delivery which ensures that all of this taking part are ready to hit the ground running after the course. “The participants on this programme were particularly receptive to the teaching methods as their event delivery is on a day to day basis both in and out of doors which makes their role particularly arduous. The professional certificate in Event and Crowd Safety is a Level 5 Certificate credit Rated by Edinburgh Napier University and worth 10 credits at University level. One of the biggest highlights of the year in Wandsworth and across London, is the annual Battersea Park Fireworks display. A great night for families and friends, with lots of entertainment and fun. Sign-up to our newsletter for the latest information, when to buy tickets, details of the day plus other exciting offers!